The lawyer for the "Piano Man" has told the BBC his client was suffering a psychotic episode in the months he spent in silence in a Kent hospital. 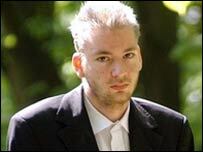 Christian Baumann has also said that Andreas Grassl's actions were not "an act of deliberate deception". Reports had cast doubt on his condition after Mr Grassl found his voice, revealed his identity and went home. Questions have been raised as to why no inquiries were made when his parents in Bavaria, Germany, reported him missing. We really need a name and strong descriptive details of the person, something the authorities did not have. They were told because he was an adult nothing could be done to find him, something the National Missing Persons Helpline in the UK said must change. Co-founder Mary Asprey added: "When we first started our charity authorities were not very keen at looking for adults. "But the police have learned that age shouldn't make a difference because people can be vulnerable at any age." Mrs Asprey said a European database for missing people would not have helped in Mr Grassl's case because "you need a name and strong descriptive details of the person, something the authorities did not have". There have also been suggestions the health trust may sue for tens of thousands of pounds but NHS chiefs have not commented. Mr Baumann said: "It wasn't intended as an act of deliberate deception. "He was suffering a psychotic episode - part of a psychotic illness." According to health experts, people who experience psychotic episodes lose contact with reality and often suffer hallucinations and delusions. Mr Grassl's father has declined to speak to reporters. The identity of the Piano Man had baffled carers for four months. Andreas Grassl, 20, from Prosdorf, Germany, was taken to a Kent hospital after he was found on a beach in April. He was unable to speak to health workers, but reportedly stunned them with his brilliant piano playing. However, newspaper reports have suggested he was only able to play one note continuously.